Ramona Zepeda is the Donor Relations and Communications Manager for Shoes That Fit, a national non-profit that provides new athletic shoes to kids so they can learn, play, and thrive. Her professional background is in communications and fundraising, having worked in public relations in the political sphere and in fundraising for a hospital. She graduated from Thomas Aquinas College in Santa Paula, California. After a brief year and a half in New York City, Ramona returned to the California sunshine and found her calling in development. When not working, she splits her time between reading and eating Mexican food. Tie everything back to the donors. Focus on their achievements. Don’t just frame it in terms of the nonprofit’s achievements. What did the donors make possible this year? Did their generosity give scholarships to 253 kids? Did their volunteer hours help feed over 500? Do a little humble bragging about your donors. involved, how giving makes them feel. Personal stories make giving seem more approachable and human. People can imagine themselves giving. This approach can appeal to potential donors by showing them all the ways they can give, and can also motivate a current donor to support in a new way. We all know that a picture is worth a thousand words, and in the digital age it has never been more true. Pictures can grab attention and convey the need more thoroughly, emotionally, and quickly than the most carefully crafted paragraph. Also use visuals with your financials and statistics. Maybe this is just me, but I find numbers much easier to grasp when I see a visual. Use bar charts, infographics, pie charts (or donut charts if you’re Homer Simpson). This is your chance to get your stats to stick in your donors’ minds. This may seem obvious. And it should be. Be sure your financial data is rock solid but clear as glass. Make sure the areas you are reporting on are consistent year to year. Your donors want to know that you are a good steward of their funds. Be honest, be transparent, and you’ll build trust. Read over your draft as if you knew nothing about your charity. Would you come away with a clear understanding of the mission, values, and impact? While we live and breathe the non-profit life, we can unconsciously assume that everyone knows this or that about our program, or where we are based, or our ways to give. Be sure that your Who, What, Where, When, How, and Why are all there. Also checkto see if you are also including the nitty gritty details of mailing address, who’s on the board, areas served, tax-id, social media handles, website, and who to contact if someone has questions or wants toget involved. 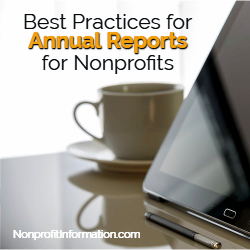 The annual report is an opportunity to get facts, stories, and your gratitude to stick in your donors’ minds. This may motivate more involvement, more giving from them. It also provides them the tools to become your new ambassadors, sharing your story and mission in a personal and authentic way.